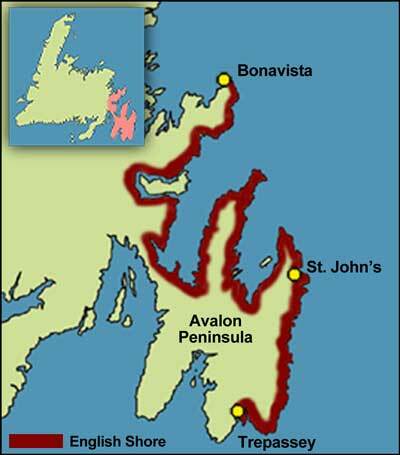 It is not known when the first European fishermen visited what is now the eastern Avalon Peninsula. Vague but unproven traditions suggest that mariners from Bristol may have been visiting the offshore fishing grounds, and perhaps coming ashore for wood, food and water, before John Cabot's voyage in 1497. Written between December 1497 and January 1498 by the English merchant John Day, the letter contains valuable information about John Cabot's voyages. 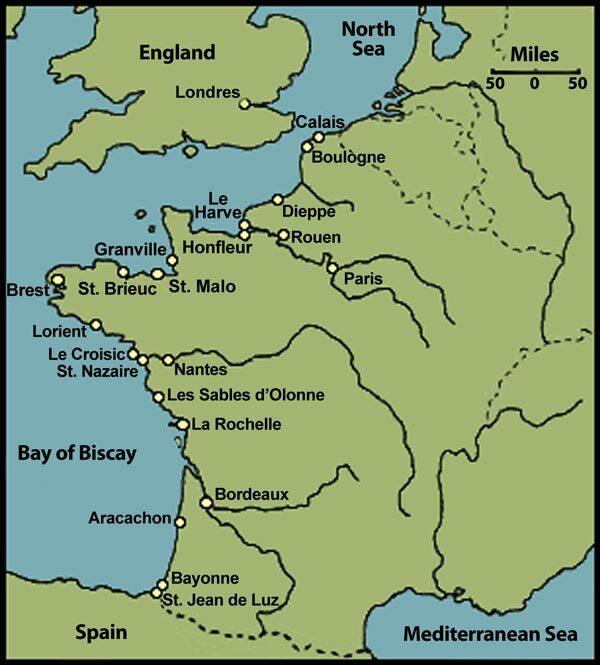 Day's letter reported details of Cabot's 1497 expedition and claimed that what John Cabot discovered "is assumed and believed to be the mainland that the Bristol men found." From Ian Wilson, John Cabot and the Matthew (Tiverton, England: Redcliffe Press, © 1996) 6. 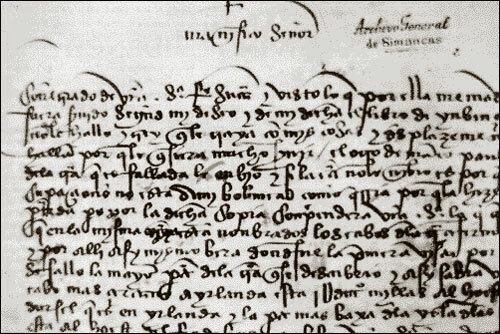 Courtesy of the Spanish National Archives. Valladolid, Spain. Whether or not there is a grain of truth to these traditions, it is clear from even the scant historical record that follows Cabot's voyage that western European fishermen were quick to exploit the resources reported by Cabot. Within a decade or so of his voyage, vessels from Portugal, Spain, the Basque country, France and West Country England were exploiting the vast cod stocks reported to exist off the coast of the "New-founde-land." By the 16th century, France was among several western European countries which were exploiting Newfoundland's cod stocks through a migratory fishery system. Illustration by Tina Riche. ©1997, Newfoundland and Labrador Heritage Web Site. Ferryland, with its location as one of the easternmost points in North America, its conspicuous headland and excellent harbour, easy access to the inshore fishing grounds and extensive cobble beaches upon which fish could be dried, may have been one of the earliest ports visited by migratory fishermen. The extensive artificial cobble 'beaches' at Ferryland were constructed for drying fish. This painting is a detail from Stewart Montgomerie's larger panoramic mural. Reproduced by permission of the Colony Café. Painting by Stewart Montgomerie, 1997. Original housed in the Colony Café, "The Pool", Ferryland. English participation was limited until the mid-16th century, but beginning about 1560 English participation in the migratory fishery increased rapidly, and they soon became the dominant fishing presence on what was to become the "English Shore." Beginning in the 1500s, English involvement in the migratory fishery increased dramatically. By the mid-17th century they dominated a section of the south-east coast of Newfoundland which became known as the "English Shore." Illustration by Duleepa Wijayawardhana. © 1998, Newfoundland and Labrador Heritage Web Site. Traditionally, the master of the first English ship to arrive at a particular port became the fishing admiral, a sort of unofficial governor of that port for the coming fishing season. Thus William Sayre was admiral of Ferryland during the summer of 1597. Reminders of the days of the fishing admirals exist in the many place names - Admiral's Cove, Admiral's Point and so forth - that can be traced to the pre-settlement period. At Ferryland, the fishing admiral period may have ceased with the first permanent settlement in 1621, but migratory fishermen continued to visit the harbour throughout the 17th century. A beechwood shovel used in the migratory fishery to spread salt over dressed fish. Found at the Ferryland archaeology site, it may have come from one of the 17th-century vessels sunk in the harbour. Although the shovel's precise date is uncertain, it falls somewhere between 1600 and 1800.